In 2010 my brother had a 10" tumor removed from his back. After 6 months of recovery, he had numbness in his foot. He was rushed to Mayo for emergency surgery and another golf-ball sized tumor was removed. 3 days later the oncologist said the cancer had spread to his lungs and he would have months, not years to live. After battling cancer for 9 months, he passed away on August 30th of 2011. He was 47 years old. My brother Rob and I were both avid fishermen. When he caught his first Musky in 2006, the fever hit me. Two months after his death, on what would have been his 48th birthday, I managed to catch a 34" musky in his honor while wearing a sweatshirt he had given me before he passed away. It was a very emotional day for me. 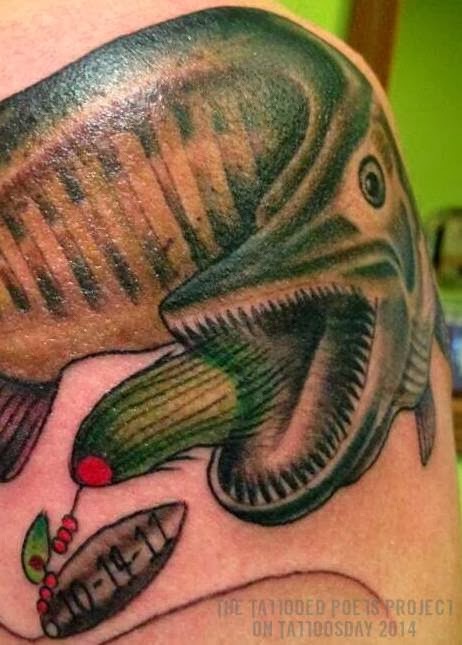 I got the a tattoo of a musky in his honor in April of 2013. 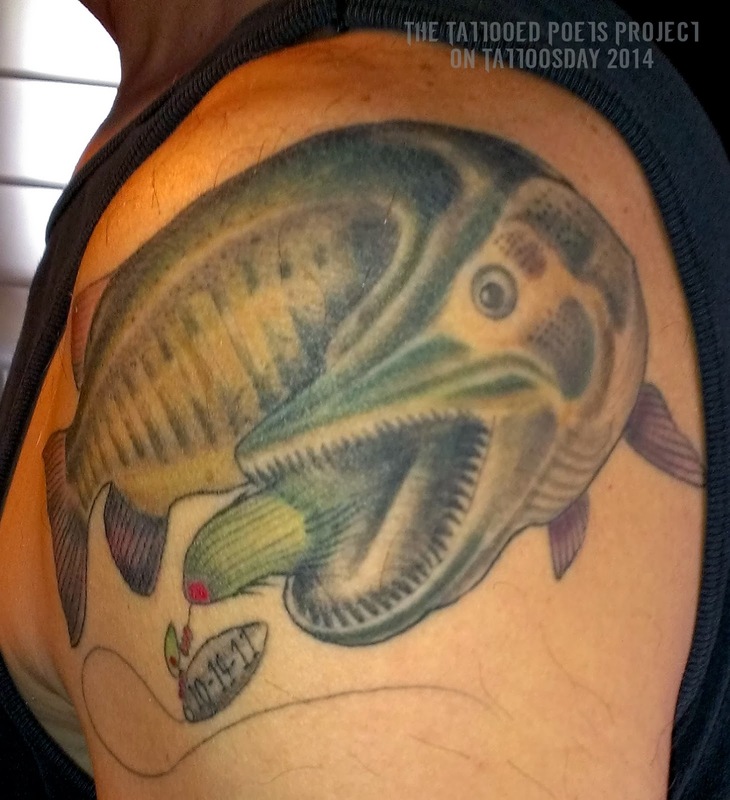 The date I caught the fish, 10/14/11 (his birthday) is worked into the spinner of the tattoo. In a related side-story, on the same day I got the tattoo, my wife and 80 year old mother both got their first tattoos as well, by Aaron at Anchors End Tattoo in Hudson, WI. My mother's was an anklet with 7 hearts for her 7 children, two of them hollow for my brother Rob (above) and sister Linda who died at age 5 of a Wilmes tumor. The artist said 'Well, not to be morbid, but what if you should lose another child, what would we do with the heart?' She replied, 'Oh don't worry about that, I'm jumping off a bridge if another one of my kids precedes my death.' That's my mom, 80 years and spunky. So, the day I got this tattoo will always be a memorable one. My wife and mom were part of it and I love the tattoo. It's a part of me and brings me closer to my brother somehow. “They’re the fish of 10,000 casts,” God argued. “I caught three smallmouth yesterday…” Rob said. Rob turned to God and winked. Jim Landwehr enjoys writing creative non-fiction, fiction, and poetry. His book Dirty Shirt: A Boundary Waters Memoir was recently accepted for publishing and will be released on 6/17/2014 by eLectio Publishing. He has non-fiction stories published in BoundaryWaters Journal, Forge Journal and MidWestOutdoors Magazine. His poetry has been featured in Verse Wisconsin, Torrid Literature Journal, Echoes Poetry Journal, Wisconsin People and Ideas Magazine, the Wisconsin Poets Calendar and HeavyBear online magazine. Jim lives and works in Waukesha, Wisconsin. His website is here and he blogs here. Thanks to Jim for sharing his awesome tattoo, the emotional story behind it, and the lovely poem here on the Tattooed Poets Project!